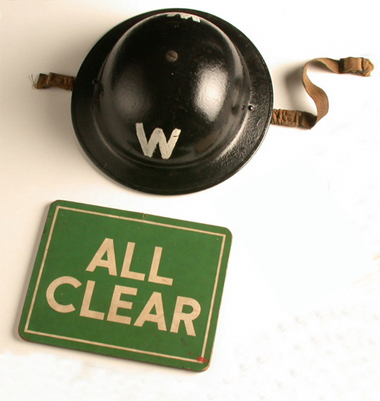 An Air Raid Precautions (ARP) warden wore this helmet during World War II, when Britain was bombed by the German Air Force. The heavy, steel helmet protected the head from falling bricks and debris. And, in a bomb blast, it protected the warden from flying rubble and glass. Air Raid Precautions prepared and protected civilians from German air raids. ARP included setting up shelters, information on what to do in an air raid, and providing equipment, such as gas masks, for use during an attack. ARP wardens were volunteers. They took charge during air raids, shepherding people into the shelters, helping casualties, and dealing with any problems. They had to put out fires and rescue people from the rubble of their homes. They also patrolled the streets at night, making sure that house lights could not be seen. The 'blackout' was to prevent any lights attracting the German bombers. The warden's helmet is black, and was worn with dark coloured clothes. A large W helped people recognise the warden during air raids, or when he or she went from house to house, checking lights, counting the number of people, and making sure that there was a safe room and fire bucket in each house. The sign has 'Alert' in red on one side and 'All Clear' in green on the other. The ARP warden used it in an air raid to warn people when an attack was in progress and to let them know when it was over. As well as signs, there were audible signals. Hooters and sirens sounded the 'alert' at the beginning of an air raid and the 'all clear' at the end. Air raids took place throughout the war and over 60,000 people died. The heaviest attacks were from 1940 to 1941 when the Germans bombed London more than 50 nights in a row in the Blitz. Each London borough had a Chief Warden. Every borough was divided into districts, and again into streets. Air Raid Precautions (ARP) wardens were appointed for every street. They had the job of checking that people followed ARP, and they patrolled their streets regularly. Wardens also inspected houses. Fires could start after a bomb had exploded. The ARP wardens checked that people had cleared wood from their attics, and that they kept a store of water ready in baths and buckets to put out any fires. It was essential that there was a shelter or safe room in each house for the family to go to if there was an air raid in the middle of the night, and wardens checked on this too. Wardens kept a tally on how many people were sleeping in each house every night because they had to check that everyone was accounted for after an attack. With all this checking up, it is no wonder that wardens were often accused of interfering in people's lives! The warbling signal of the air raid siren or the (intermittent) blasts of a hooter would warn people of an air raid. Everyone would head for the nearest shelter with his or her gas mask and identity card. Wardens would direct people to the shelter and check that everyone made it there safely. Then everyone would wait for the air raid to finish, emerging from the shelter when the ARP warden sounded the continuous siren or rang the hand bell to signal the All Clear. After a bomb exploded the ARP wardens reported it to their local posts and worked out what help was needed. They helped people at the scene -rescuing people from wrecked buildings, looking after the shocked and wounded, putting out or managing small fires, directing those who had been made homeless to the nearest rest centre and dealing with unexploded bombs (UXB) - until the emergency services arrived. The wardens wrote incident reports on the type of bomb, the time of the attack, the people hurt and the damage done. As well as the air raid warning signs, the ARP wardens had rattles to signal a poison gas attack and a bell to ring when it was over. They had hand-pumps and buckets for putting out small fires and hooks to pull down damaged ceilings. Other pieces of equipment included whistles and 'civilian duty' respirators. The steel helmet was part of the Warden's protective clothing, along with wellington boots to guard the legs in case mustard gas was used. ARP Wardens wore one-piece boiler suits in dark blue or their own clothes, with an 'ARP' armband and silver badge. Men could wear woollen serge battledress (waist-length jacket and trousers.) Women could wear jackets with trousers or a skirt, or battledress blouses with ties. The signal used to warn of danger. The signal that danger is over. The Blitz - the systematic bombing of British cities in 1940-41 by the German Air Force.